1. Rub the legs with lots of salt and pepper. Build a small fire as far to one side of a covered cooker as possible. Place the legs skin-side down on the side of the grill opposite the fire. 3. When the legs are tender, remove them from the grill, allow them to cool slightly, then remove the meat and skin from the bone and place them in a bowl. The meat should be crispy, not fatty, and you want to shred it into fairly small pieces. Add the vinegar, Tabasco sauce, and salt and pepper to taste. Mix well. This is best served immediately, but can be refrigerated, covered, for 4 to 5 days or frozen. To bring it back, place it in a pan in a 250°F oven for 20 to 30 minutes. This is an excellent use for the extra leg meat you may have left from a grilled duck breast dish. While the exposure to smoke for long periods usually dominates its prey, the taste of duck is strong enough to stand up against the smoky tenderness of barbecuing. This freezes well and can be served in sandwiches for extra fancy barbecue or with fresh tortillas. Or reserve the breasts to make Grilled Duck Breast with Kumquat-Sugarcane-Basil Glaze and serve the barbecue alongside. SERVING SUGGESTIONS: Serve this with fresh tortillas, Black Bean Salad, and Corn Bread Salad with Lime Juice and Cilantro, or with Pita Bread and Cold Orzo Salad. Nouvelle cuisine reintroduced America to the practice of cooking duck breast medium-rare. 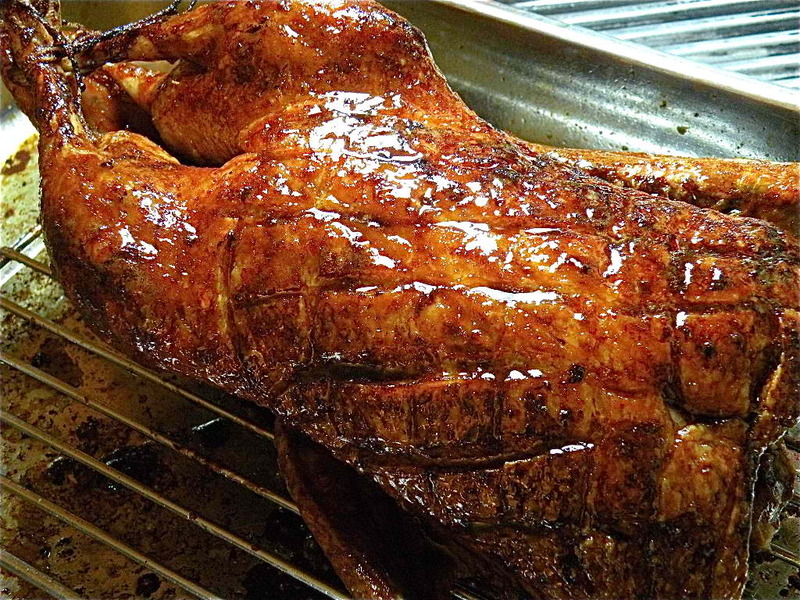 This presented chefs with the problem of how to handle the legs of the duck, since it is not appropriate to undercook them and even by nouvelle standards a single duck breast does not a portion make. So we went scurrying to create interesting treatments for the legs. Some simply served the legs separately and cooked them longer. Others made duck sausage or confit. Still others made forcemeat and stuffed Chinese dumplings or ravioli. The common factor in all of these preparations is a cooking method that breaks down tough meat. One day while racking my brain for one more creative and unusual way to use the duck legs that went with a Southern-inspired duck breast preparation, I decided to fall back on the basics—why not barbecue them? Now, as you should all know, this does not mean grilling, but rather exposing the meat to wood smoke at low temperatures for a long time, allowing for the sinews to break down completely. It worked really well, proving as usual that old ways and new products are often an excellent match.